A couple of days ago, someone came on #Nmap IRC channel asking about pcap file format. He was writing a parser in Haskell but had some issues, especially with extracting the timestamp values of the each packet. As I walked him through the file format, I decided to write this blog post as a quick reference, a reminder, or a clearer explanation depending on who is reading it. While detailing the file format, we will have a closer look at this capture file. The parts in blue are added by libpcap/capture software, while the parts in red are the actual data captured on the wire. The first part of the file is the global header, which is inserted only once in the file, at the start. The global header has a fixed size of 24 bytes. 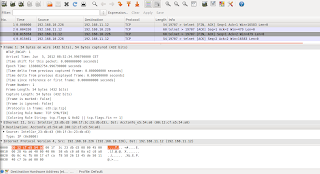 The first 4 bytes d4 c3 b2 a1 constitute the magic number which is used to identify pcap files. The next 4 bytes 02 00 04 00 are the Major version (2 bytes) and Minor Version (2 bytes), in our case 2.4. Why is 2 written on 2 bytes as 0x0200 and not 0x0002 ? This is called little endianess in which, the least significant byte is stored in the least significant position: This means that 2 would be written on 2 bytes as 02 00. How do we know that we are not using Big Endianness instead ? The magic number is also used to distinguish between Little and Big Endianness. The "real" value is 0xa1b2c3d4, if we read it as as a1 b2 c3 d4, it means Big E. Otherwise (0xd4c3b2a1), it means Little E.
Following are the GMT timezone offset minus the timezone used in the headers in seconds (4 bytes) and the accuracy of the timestamps in the capture (4 bytes). These are set to 0 most of the time which gives us the 00 00 00 00 00 00 00 00. Next is the Snapshot Length field (4 bytes) which indicates the maximum length of the captured packets (dataX) in bytes. In our file it is set to ff ff 00 00 which equals to 65535 (0xffff), the default value for tcpdump and wireshark. The last 4 bytes in the global header specify the Link-Layer Header Type. Our file has the value of 0x1 ( 01 00 00 00 ), which indicates that the link-layer protocol is Ethernet. There are many other types such as PPPoE, USB, Frame Relay etc,. The complete list is available here. After the Global header, we have a certain number of packet header / data pairs. The second field (4 Bytes) is the microseconds part of the time at which the packet was captured. In our case it equals to b6 35 0f 00 or 996790 microseconds. The third field is 4 bytes long and contains the size of the saved packet data in our file in bytes (the part in red following the header). The Fourth field is 4 bytes long too and contains the length of the packet as it was captured on the wire. Both fields' value is 36 00 00 00 (54 Bytes) in our file but these may have different values in cases where we set the maximum packet length (whose value is 65535 in the global header of our file) to a smaller size. After the packet header comes the data! Starting from the lower layer we see the Ethernet destination address 00:12:cf:e5:54:a0 followed by the source address 00:1f:3c:23:db:d3. To sum it up here is our file. Glad that you found it to be useful. Thanks man it really helps !! But could you tell me how to make a c program to extract all the headers in the pcap file? 1. open file for reading. 2. skip/read the global header. 3. "while" we haven't reached the end of file, read/extract the header and skip the X bytes of data. This is really helpful, thanks! So does this mean that a pcap file adds 16 bytes against each frame? And therefore it should be 16*(number of frames) bytes larger than the sum of the lengths of all the frames it contains? thanks..the information is very helpful...!!! 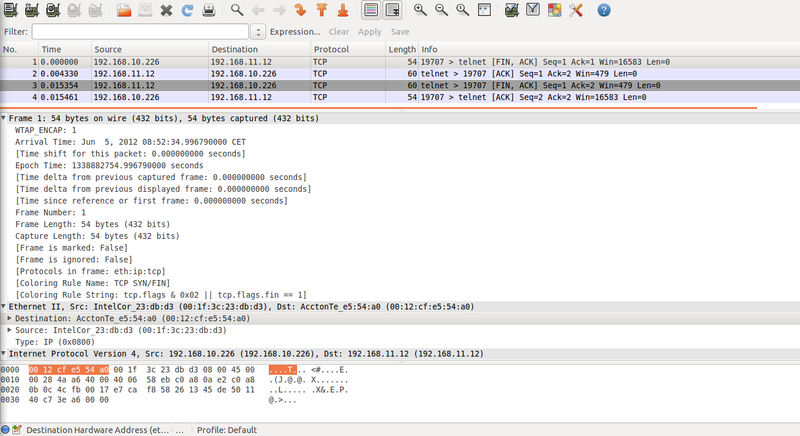 Very helpful details, this would help me to write script file to generate new pcap file without segmented tcp packets. Thank you for the author, really appreciate. There's no notion of a "block size" in UN*X and Windows when reading files in binary; a file is just a sequence of bytes. Very helpful post Hani. Thanks for writing this up! I want to make a C program to create a pcap file. My input file is Text file which containing multiple packets of data. And How I know one packet is ended here in that input file? And note that the magic number can either be d4 c3 b2 a1, if the file was written by little-endian code, or a1 b2 c3 d4, if the file was written by big-endian code. That also indicates the byte order of all *other* multi-byte integer values in the headers, although the byte order of the packet *data* is, except for some metadata headers, in the byte order in which it appeared on the network. This has helped me greatly decoding the header but now I am stuck on the actual packet data format. Your explanation ends by stating that the data starts with ethernet destination address of 00:12:cf:e5:54:a0. However, the actual destination IP address of 192.168.11.12 as C0:A8:0B:0C is much further down in the data block (on the 5th line of the dump). I've been searching google but so far haven't found a descriptor which matches what we see in this dump. Can anyone point to a suitable online guide?